Pictured above: (in front) Anna Calleja, Gigi Gatt, Julia Frendo, Kurt Sultana, Emma Blake, Ben Flynn, Janine Camilleri and Matt Paris. (standing) Emidio Friggieri, Head Judge; Education Minister Evarist Bartolo; Tonio Axisa, Business Advisor; Mark Watkinson, CEO of HSBC Bank Malta plc; and David Pace, Chairman of JA-YE. A team of eight Sixth Form entrepreneurs from St Aloysius College are off to Tallinn, Estonia representing Malta at the European Company of the Year Competition. Concentr8 was selected as the HSBC Company of the Year 2013/14, winners of the Junior Achievement (Young Enterprise) Company Programme by a panel of judges during the National Finals. 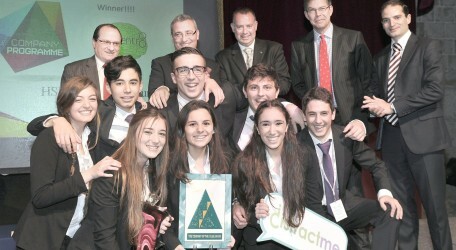 Ten teams from various Sixth Form colleges in Malta and Gozo competed for the coveted award. Concentr8 also won The Best Business Plan Award, presented by Deloitte; The Best Quality Systems Award, presented by Adpro; and The Social Enterprise Award, presented by Microsoft. Concentr8 designed, developed and launched an educational app called ‘DistractMe’, available for free on Apple Store and Google Play. The app is specifically aimed to encourage and assist students to focus, and remember study content while making their exam revision an integral part of their everyday use of their smartphones, tablets and laptops. Although the app is custom built for the O level syllabus, its versatile design allows it to expand to virtually any test or examination board. The Maltese contingent will be competing later this month, over the course of three days, against another 35 European finalist countries and are currently seeking corporate support for this initiative. They can be contacted via e-mail at: [email protected] or through www.facebook.com/concentr8ye. Concentr8 developed the app as part of its participation in the HSBC Company Programme, organised every year by the Junior Achievement (Young Enterprise) Malta Foundation, a non-government, non-profit organisation promoting entrepreneurship education, skills for employability and financial literacy.